After the death Friday of communist Cuban leader Fidel Castro, several politicians in the United States reacted to the news, including President Obama, who offered condolences to the Castro family and extended “a hand of friendship” to the Cuban people. Mr. Obama mentioned his own efforts during his White House tenure “to put the past behind us,” despite the nearly 60 years of political discord between the U.S. and its island neighbor. Earlier this year, the president made an historic visit to Cuba, following his efforts to normalize diplomatic relations between the U.S. and the island nation. Mr. Obama was the first sitting president to step foot on Cuban soil since Castro’s guerrilla force overthrew the U.S.-backed government in 1959. President-elect Trump, who is spending the holiday weekend in Mar-a-Lago, his Palm Beach, Florida, resort, issued his own succinct statement, delivering it on his favorite social media platform. The president-elect, via Twitter, has also weighed in on U.S. policies regarding Cuba in the past, pledging to “reverse” the Obama-led efforts to normalize relations between the two countries. The people of Cuba have struggled too long. Will reverse Obama’s Executive Orders and concessions towards Cuba until freedoms are restored. “His legacy is one of repression at home and support for terrorism abroad. Sadly, Raul Castro is no better for Cubans who yearn for freedom,” Royce said. The communist dictator, however, was “fondly” remembered by former President Jimmy Carter, who took several steps to normalize relations between the U.S. and the island nation during his time in office, including the establishment of “interest sections” — now embassies — in Havana and Washington. A news ticker in New York’s Times Square announces Fidel Castro’s death, November 26, 2016. In a statement, President Barack Obama said, “We know that this moment fills Cubans – in Cuba and in the United States – with powerful emotions, recalling the countless ways in which Fidel Castro altered the course of individual lives, families, and of the Cuban nation. History will record and judge the enormous impact of this singular figure on the people and world around him. “For nearly six decades, the relationship between the United States and Cuba was marked by discord and profound political disagreements. During my presidency, we have worked hard to put the past behind us, pursuing a future in which the relationship between our two countries is defined not by our differences but by the many things that we share as neighbors and friends – bonds of family, culture, commerce, and common humanity. This engagement includes the contributions of Cuban Americans, who have done so much for our country and who care deeply about their loved ones in Cuba. The death of Cuban leader Fidel Castro prompted celebrations among the country’s exiles in Miami — and expressions of sorrow from some leaders worldwide. “Feels weird,” said Gabriel Morales, a 40-year-old financial executive in Miami, whose parents left Cuba after Castro came to power. “Been waiting to hear this news all my life. Seems unreal,” Morales said in a text message to an Associated Press reporter. 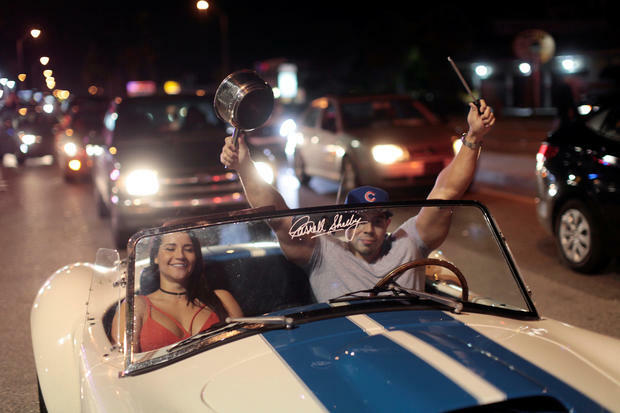 People celebrate after the announcement of the death of Cuban revolutionary leader Fidel Castro, in the Little Havana district of Miami, Florida, U.S. November 26, 2016. However, Castro was mourned by some present and former national leaders. Castro was a defiant demagogue, a dictator, a charismatic leader and, for decades, a Soviet puppet, all rolled into one, CBS News’ Pamela Falk, author of “Cuban Foreign Policy,” said. The communist adversary for 10 U.S. presidents, Castro wore his trademark beard and army fatigues for nearly five decades, giving fiery speeches against what he called the evils of imperialism. In the 1950s, Castro led the overthrow of Cuban dictator Fulgencio Batista. Having seized power after years of fighting from the Sierra Maestra mountains, Castro was among the longest-serving heads of state, and he successfully gave Cuba outsized prominence in world affairs. He eliminated illiteracy, but failed to bring prosperity. Castro achieved a low infant mortality rate and a national health care system but at a price. He had no tolerance for dissent. Counter-revolutionaries were jailed by the thousands. He nationalized private real estate and many fled the island or were forced out. “With his death, the Chinese people have lost a close comrade and a sincere friend. His glorious image and great achievements will be recorded in history forever,” Xi said in a telegram to Raul Castro, state broadcaster CCTV said. In a sign of his personal esteem, Francis signed the telegram, breaking from the Vatican’s usual practice of have the secretary of state send such messages. Francis met Castro during the papal visit to Cuba in September 2015. 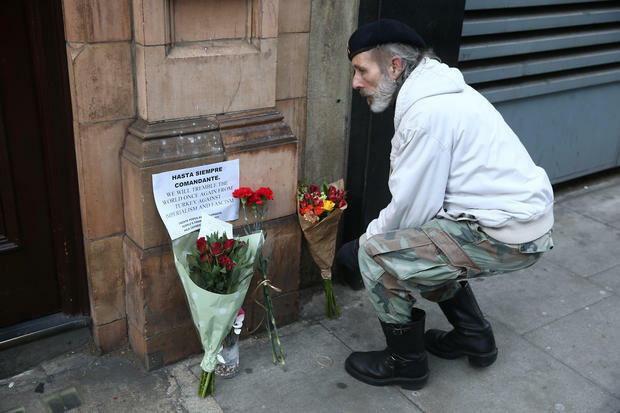 A man looks at tributes outside the Cuban Embassy in London, following the announcement of the death of Cuban revolutionary leader Fidel Castro, central London, Britain November 26, 2016. “As a son of Spaniards, former president Castro always maintained close relations with Spain and showed great affection for his family and cultural ties. For this reason Spain especially shares the grief of Cuba’s government and authorities,” the government statement said. 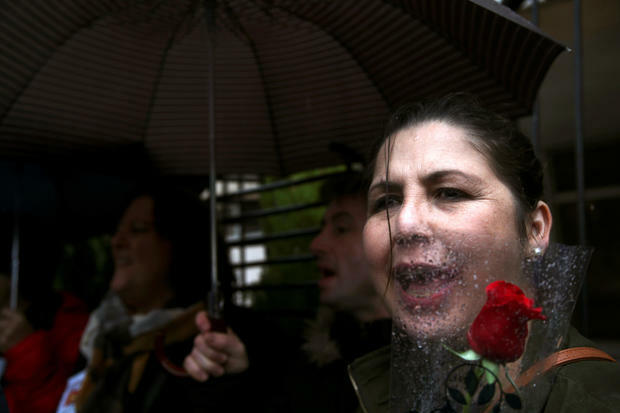 A supporter of late Cuban revolutionary leader Fidel Castro holds a red rose as she sings with other supporters during a gathering outside the Cuban Embassy in Madrid, Spain, November 26, 2016. 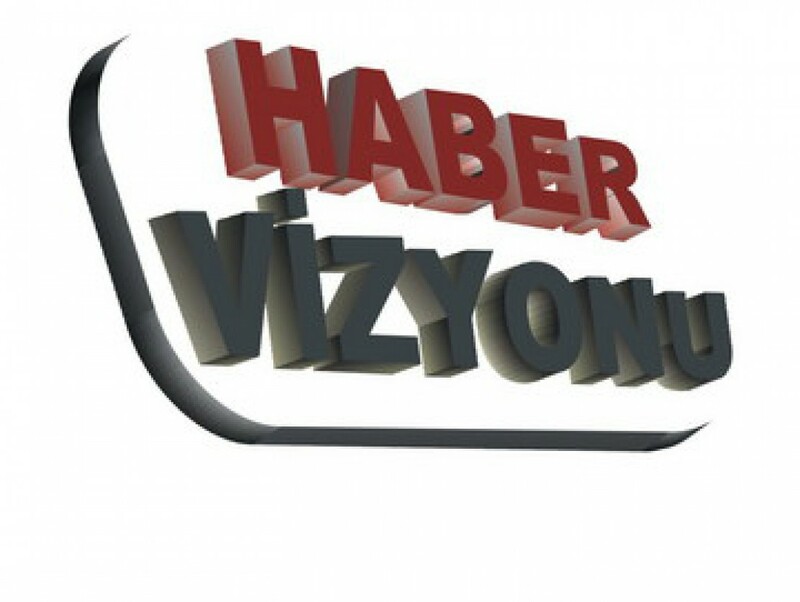 “Fidel Castro in the 20th century did everything possible to destroy the colonial system, to establish cooperative relations,” former Soviet President Mikhail Gorbachev was quoted as telling the Interfax news agency. Venezuelan President Nicolas Maduro recalled Castro’s departure from Mexico on the yacht Granma with his brother Raul and several dozen supporters to start their revolution. CBS News producer Portia Siegelbaum has covered Cuba for 12 years. She joins “CBS This Morning” by telephone from Havana to discuss the “strange” and “quiet” reaction to former President Fidel Castro’s death in Cuba, and the different reactions across generations. Fidel Castro’s reach extended far past his long and defiant relationship with the U.S. Jonathan Vigliotti reports on the worldwide reaction to the former Cuban leader’s death from London. Reaction was fast following former Cuban President Fidel Castro’s death, mainly in the Little Havana section of Miami where hundreds of Cubans settled when Castro came to power. For them, Castro’s death is a cause for celebration. David Begnaud reports from Miami’s Little Havana.